What was it like to be an art student and face full-on UK media coverage? As an art student in the UK a decade ago, I survived a media frenzy. I was one of thirteen Leeds art students who decided that, instead of staging a conventional end of year show, we would pretend to go on holiday. This is an account of a faked holiday to Spain and how the national media became part of our artwork, entitled Going Places (1998). Leeds 13. One of several photos documenting Going Places (1998). Here the artist group presented documentation of a holiday to Spain as an art performance, when the photos were in fact taken in northern England. The sequence of events began with a proposal for funding to the University Union, who gave us over £1000 to put on an exhibition. Although an exhibition space was booked, no conventional artworks were produced. Instead, we collaborated in producing evidence of a holiday in Malaga. 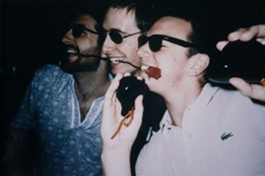 This included photos of us in a Leeds outdoor pool, the North Sea and in Spanish-looking bars; fake tickets and boarding passes and Spanish souvenirs and tans from a hired sun-bed. For the week before the opening night, we did not go to any classes or answer the phones, as we hid from our friends. When guests arrived for the opening night, they were met by an actress playing an air hostess, sangria and flamenco music, but no artwork. The hostess then put the guests on a hired bus that took them to the airport. 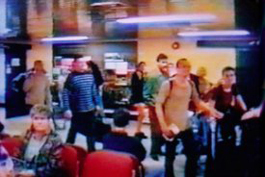 In arrivals, the airport authorities had put up a non-existent flight on the arrivals screen for us; we appeared as though we had just emerged from passport control with our “evidence”. 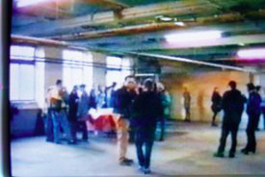 Video documentation of Leeds 13 simulation and performance (1998). To the left, guests gather at the art show opening. After being taken to Leeds-Bradford airport, they greet the Leeds 13 “arriving from their Spanish holiday”. We did not invite any press to the opening night in case our claims were all too transparent. Nevertheless, we kept to our story and after a few days the student newspaper ran a front-page headline: “Con Artists’ Spanish Rip-off – Art grant funds holiday in sun". After a few more days the story made one national paper and then it seemed that everyone picked up on it. The story had spread virally, from one media outlet to the next without us doing anything further. Like the others, I was a young person with no experience to prepare me for this. There was a succession of interviews for TV, radio and newspapers. There were also photo-shoots and live TV appearances. None of this was made any easier by a largely hostile response. Worried that we would be found out if anyone did some cursory research, we decided to explain how we had staged the holiday out of a genuine interest in the assumptions and stereotypes that circulate around contemporary art. The admission was made on BBC Radio 4’s Today programme. Ostensibly there to defend our misuse of funds, I told them that we had faked the photos and the unspent money was due to return to the university union by standing order. A second wave of media attention then ensued, even bigger than the first. Now the story was about how the media had been fooled. Positive coverage was assured from those who had not covered the initial story, and could now gleefully report on how their peers had been duped. Those that had run the story were not so happy. I certainly felt awkward experiencing that level of attention, especially when it was based on deception. We tried to argue that the ends justified the means but this aspect is not something that I am comfortable with. Despite this, the project did raise awareness of the fallibility of the media, who are not the purveyors of objective truth that some claim. In retrospect, the common complaint made by artists that the media treats their work superficially is born out by the project. However, the popular media look for punchy and simplistic ways of covering most things. Some artists even recognise this and are able to use it to reach massive audiences but there is an inevitable loss of control involved. In part, this is because media institutions look for angles that affirm particular values held by the editors, advertisers and target audience. Going Places received coverage precisely because it apparently supported such values related to the misuse of taxpayers’ money, lazy students and contemporary artists lacking skill, relevance and responsibility. I have been asked for advice by artists who aspire to use the media to their benefit, as it is not easy to manipulate the media. Media institutions primarily get stories secondhand from other media, and so sending out thousands of press releases as an unknown artist is not likely to get very far. Since we primarily wanted to test the conventions and criteria that we faced as art students—and were not just trying to fool the media—-I recommend working on projects that are worth pursuing in their own right. It was an achievement to reach a level of public awareness that few art students have matched before or since. Not only did the project spark some heated debate about art but also about the media. In this respect I am proud to have been one of The Leeds 13. 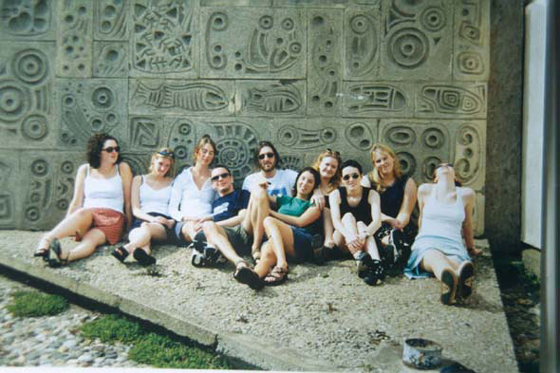 The Leeds 13 at the time of Going Places were: Laura Baxter, Simon Clark, John Crossley, Matthew Dunning, Hannah Foot, Christian Hersey, Siân Jones, Jenny Larkin, Sarah Leech, Emma Robertson, Sarah Thornton, Eleanor Welsh, and Susannah Wesley. Victoria Anderson and Ben Halsall are also members of the artist group. Click to see a full-on compilation: "Publicity outputs, Leeds 13-style".